What have Scouts been up to for the past year? Tons. But instead of merely telling you, why don’t I show you? The Boy Scouts of America released its 2011 Report to the Nation today, showing the outside world what Scouts accomplished last year. A delegation of nine young people from across the country will visit Washington, D.C., beginning tomorrow to embark on a whirlwind tour. They’ll take part in visits with top government officials, a service project benefitting the National Cathedral, and exclusive tours of the Pentagon, White House, CIA building, and Supreme Court. 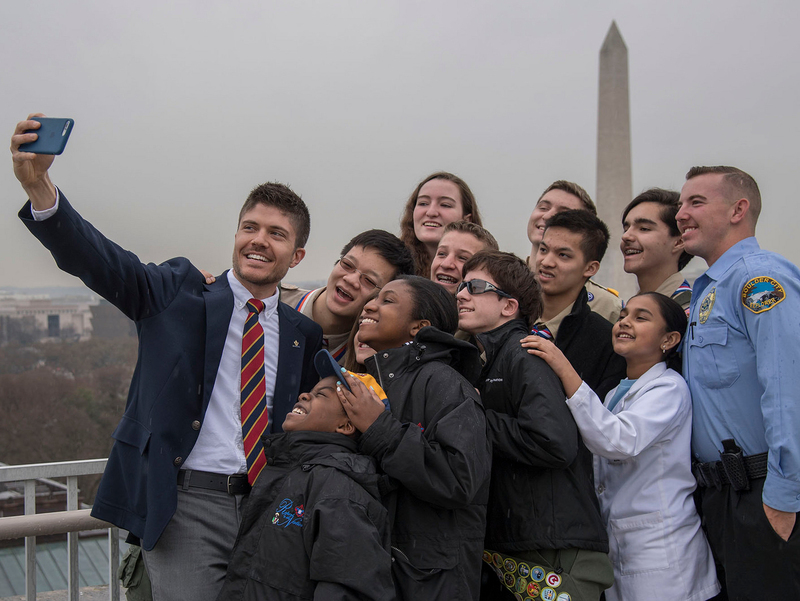 The Scouts will deliver this year’s report to a bipartisan group of top politicians in Washington, including Speaker of the House John Boehner, House Minority Leader Nancy Pelosi, Senate Majority Leader Harry Reid, and Senate Minority Leader Mitch McConnell. The officials won’t get the report until Wednesday, but you can read it right now. Click here to download the PDF text version. Or if you prefer your information in a visual form, check out the 2011 Report to the Nation infographic or YouTube video, both embedded below. The report is a public reminder of what we already know: Scouts accomplish great things all the time, and 2011 was no exception. The numbers don’t lie: 2.7 million youth members served, more than 1 million adult volunteers giving their time, 51,473 Scouts earning Eagle, and 25 million man-hours of volunteer service performed. Venturing president Dan Carriveau; Little Chute, Wisc. Boy Scout Jordan Evans; Colorado Springs, Colo.
National Sea Scout boatswain Eva Hogan; Houston, Tex. Boy Scout Nicholas Kulick; Catharpin, Va. Boy Scout R.J. McCullen III; El Paso, Tex. Boy Scout Jack Pape; Omaha, Neb. Order of the Arrow National Chief John Rehm; Turbotville, Pa.
I’ll share dispatches from the Report to the Nation delegates all next week on Bryan on Scouting, so be sure to check back for photos, quotes, and more exciting news. You can also keep up with the action on Twitter by following us (@scouting) or the main BSA page (@boyscouts).